I have a little dreidel, I made it out of paper. I folded it right up and put it away for later. I have a little dreidel, I made it out of snow. I looked for it in the summer, where oh where did it go? So what are some other things you'd like to make your dreidel out of? Share your verses in the comments! If you can't wait, how about a Virtual Dreidel Game? Have you heard of No Limit Texas Dreidel? Yes, that's right, the game of Dreidel has gotten a face-lift. Now there's a new game in town. Unless you're under the age of five or have an obsession with things that spin, the traditional version of the dreidel game is endearing - but let's face it - the game is mind numbing after a few minutes. In fact, whenever we were ready to end our Hanukkah party we found the subtlest way to clear a guest-filled house was to play a round of dreidel. Q: Can you bet the empty gelt foil? A: This question comes up from time-to-time, usually by people who've indulged in their winnings before the end of the game. They want to know if the empty foil: sans chocolate, has any betting value. Our answer is definitively: No. While you're over at ModernTribe, check out all the cool stuff in their Chanukah Shop. (Including this peace sign menorah, which is clearly priceless! Make sure you look at the price...) And they're home of these really cool t-shirts. The folks at ModernTribe have generously given me one No Limit Texas Dreidel set to give away to one of you, my beloved readers. How cool is that? How can you share the joy of No Limit Texas Dreidel with your friends and family? Comments will close at 8am Wednesday, December 17th. Come back all week and next for some great Chanukah posts and giveaways! Comments closed....winner is Rebecca, aka @tzurriz! Mazel tov! Had the chance to play this last year -- it rocks!!! Hoping to get one for my poker-playing brother. Looks like a nice game to play. Looks like great fun for our family Hanukkah party! Thanks so much and happy Hanukkah. I am so in the market for this game this year. We love Texas Hold'em and Evan always wants something to play on Shabbat so this would be great. I also tweetered away!!! Count me in! I even twittered properly! This would be an awesome game to play with my kids. Always looking for a new game each year. Thanks for the opportunity! How fun! Especially cool since we have a dreidel collection of sorts. This looks great! And, yes, I will twitter about it! Well, hey, what a fun idea! We are not Jewish, but my 7yo daughter asked me the other day if we could get a Menorah! She asked if they had them in the paint-your-own-pottery store! She loves to learn about other families' traditions. My children would LOVE this! Happy Chanukah everyone! Chanukah Countdown Roundup & a Tree! Hug Your Menorah - Giveaway! 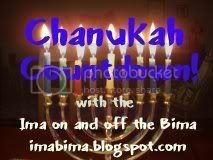 Chanukah Countdown, Food, & Giveaway! The Chanukah Countdown is coming!!! !